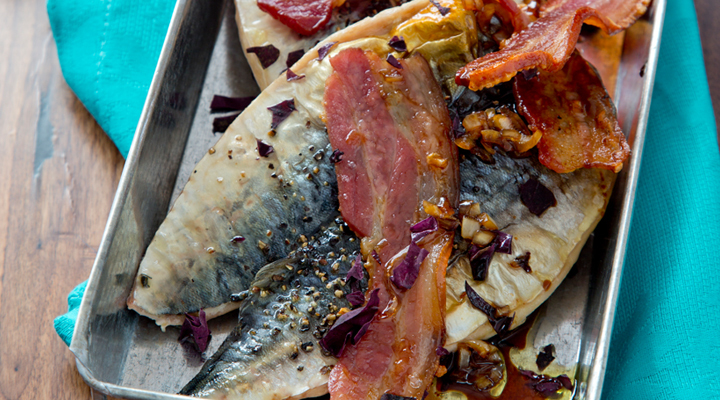 There's no need for salt in this dish, as the toasted Irish seaweed, bacon and sherry vinegar will bring out the flavour of the mackerel. Seaweed can act as a great replacement for salt if you are trying to cut back. 2. Sprinkle some freshly ground black pepper on the mackerel fillets, then rub a little of the oil on top. Place on a baking tray with the bacon and grill for 6 to 8 minutes. 3. Heat the remaining oil in a small frying pan set over a medium heat. Add the sliced shallots and cook until soft, then add the sherry vinegar and remove from the heat. 4. Meanwhile, place the seaweed in a dry pan set over a medium-high heat and toast for a few minutes, then snip into small pieces with kitchen scissors. 5. Place the mackerel on a plate and sprinkle the toasted Irish seaweed on top. Spoon over the shallots and sherry vinegar and finish with the grilled bacon. Serve with a winter salad.